If you are a fan of classic movies, it’s almost impossible to think of Vivien Leigh as anything other than a Southern belle. She so perfectly embodied Scarlett O’Hara in Gone With The Wind (1939). The actress, however, was not Southern or American. She was English. Yet she did share some traits with her iconic character. Leigh was strong-willed and passionate about the man she loved, much in the way Scarlett had a complete infatuation with Ashley Wilkes. The first time Vivien Leigh laid eyes on the English actor Laurence Olivier, she apparently told a friend, “That’s the man I am going to marry.” This was a little more complicated than love at first sight. Both actors were married to other people at the time. Yet, just as Leigh predicted, they did fall in love and live together even while they were both still married to others. Eventually, they got divorces and met at the alter in 1940. 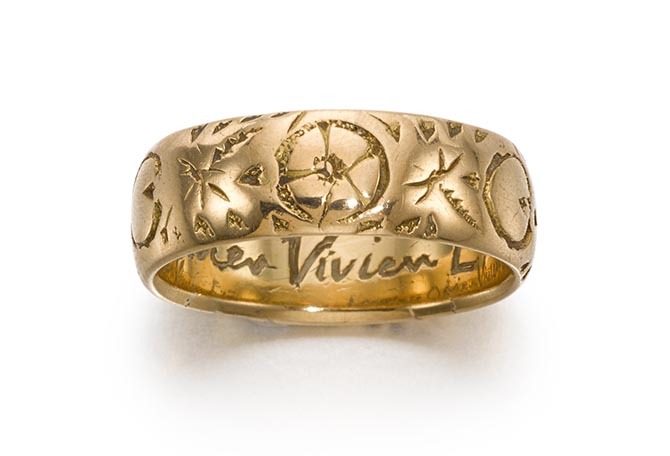 At some point during their 20-year union, Olivier gave Leigh a gold band ring (photo below) engraved ‘Laurence Olivier Vivien Eternally.’ It is part of The Vivien Leigh Collection of 250 lots including everything from fine art to personal photos and clothing being sold at Sotheby’s in London on September 26, 2017. Beyond the dramatic inscription on the ring, there is no additional anecdote attached to the jewel. It’s possible it was her wedding band. The piece carries an estimate of approximately $524 to $786. Seriously-low numbers considering the fame of the couple and the intensity of the sentiment. 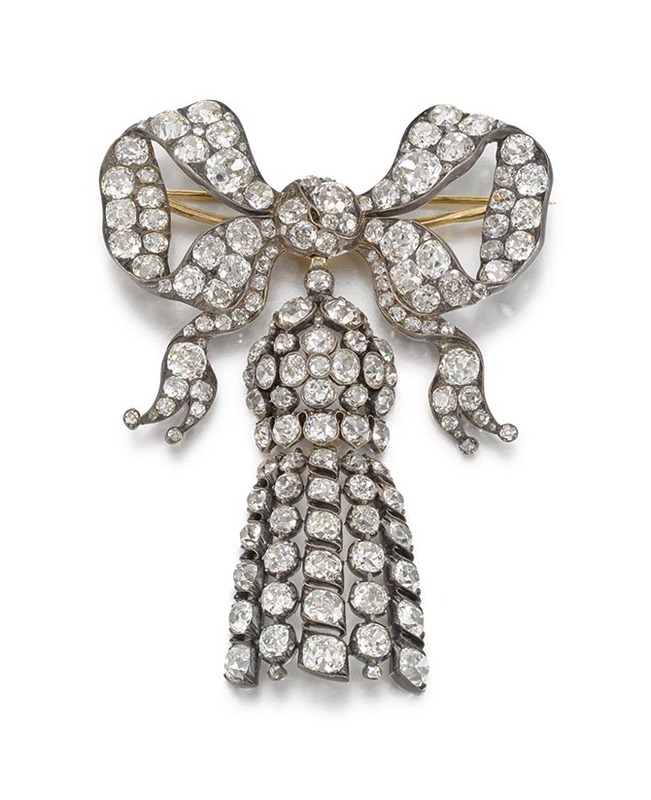 Another piece in Leigh’s collection that is reminiscent Scarlett O’ Hara is her antique diamond bow brooch (seen below). While the charmer is about a hundred years too late for the Civil War setting, the bow design is so reminiscent of the over-the-top femininity of Scarlett’s outfits in the film. The estimate for the jewel $32,738 to $45,834. When producer David O’Selznick was casting for the role of Scarlett O’Hara every actress in Hollywood wanted the part. A 24-year old Leigh felt it was hers for the taking. She told a journalist, “I have cast myself as Scarlett O’Hara.” Some of the actresses she beat for the role included more established names at the time. 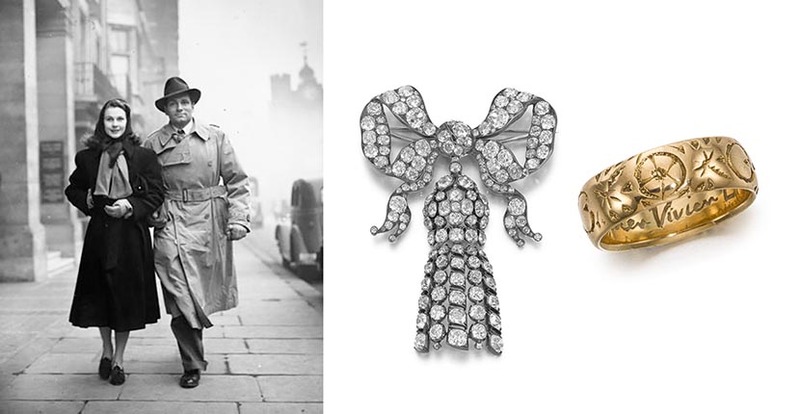 Paulette Goddard was so disappointed about losing the part, her husband Charlie Chaplin bought her a demi-suite of Trabert & Hoeffer-Maubousin jewels as a consolation prize. She wore the jewels in The Women (1939). The man who is credited with securing the role for Vivien Leigh, her agent Myron Selznick, who also happened to be producer David O’Selznick’s brother, gave the actress and Laurence Olivier a gift that appears in the Sotheby’s auction. 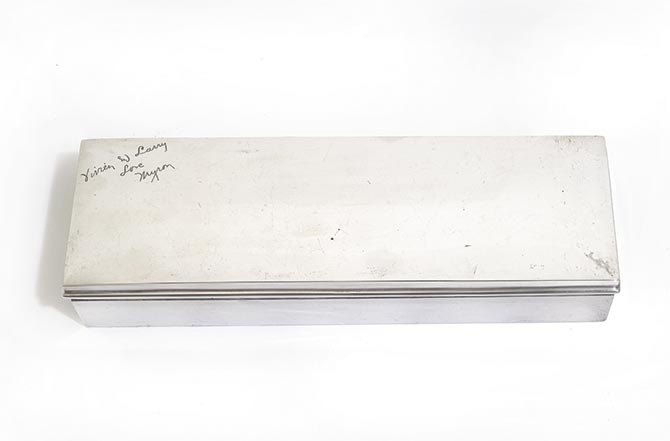 The rectangular silver cigarette box (seen above) is engraved “Vivien and Larry, Love Myron.” The estimate is approximately $524 to $786. 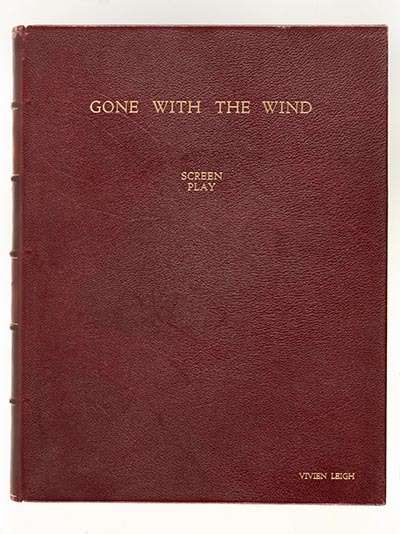 Among all the memorabilia, perhaps the items with greatest sentimental value to fans are Leigh’s personal copy of Gone With The Wind, given to her by the author Margaret Mitchell (estimate approximately $6,548 to $9,166), and her leather bound copy of the script (seen above) given to her by the film’s cast (estimate approximately $3,274 to $4,583). *All photos courtesy of Sotheby’s unless otherwise noted.